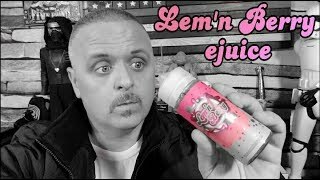 Lem’nBerry E-Juice has arrived and is making a splash among the countless boring fruit-based e-liquids that’ve oversaturated the e-juice market today. This premiere passion-project from the mix masters at Transistor harnesses the delicious power of Lemons and Berries to deliver a unique vaping experience that’s equally as juicy as it is sweet. Upon first vape, subtle Lemon undertones are infused with a sweetened Berry flavor, taking everything we know and love about that juicy Lemon flavor and enhancing it with a sweetened finish. During the exhale, an underdog is crowned victorious in this epic battle of Juicy vs. Sweet, but who won? Try this best vape juice and let your tastebuds decide!